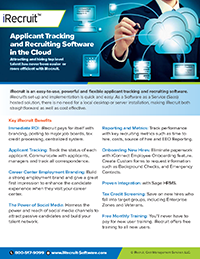 iRecruit offers free training to all users. Customers can join one of the scheduled sessions, or request a one-0n-one training for additional support. Training is done online, and sessions can be recorded by request. CMS Says: Yes, thank you for your question. We would love to work with you. We partner with several large accounting firms to provide Work Opportunity Tax Credit screening services for their clients. There are many benefits to working with CMS. manufacturing, health care, and mining. Get to know how easy it is to initiate background checks through our partner Verified First. iRecruit customers can initiate the pre-employment background screening directly from the applicant profile page, making it so quick, simple and easy to start a background screen on your new hires. Does your company have a job opening in Europe? If so, there’s a good chance your existing referral program is about to get torpedoed. With GDPR enforcement less than two months away, keep a watchful eye on this topic. Unfortunately, based on conversations I’ve had in recent months, large numbers of companies are completely unprepared to navigate these coming regulations. As a third-party recruiter, I am often amazed by the candidates who apply for senior-level IT roles that have absolutely nothing to do with their actual backgrounds. Over the years, I have gotten resumes from sales clerks, administrative assistants, and even basket weavers. (Just kidding on that last one. Does anyone in North America even know how to weave a basket anymore?) Having gotten so many bad resumes from job postings, I have learned a trick or two over the years about how to improve the quality of candidates who submit their resumes for open requisitions, saving both time and money. Dear Liz, I don’t usually fill out those online job applications but I went ahead and completed one last week. The job is perfect for my background. I was pleased to get an email message back from the company within two hours. The message said, “Good news! We would like to explore your qualifications for the Senior Product Associate role. Here are links to three tests: our writing test, math test and personality test. We all know that job candidates are getting fed up with how they’re treated when they apply for jobs. That’s why the “candidate experience” — how job seekers perceive and react to employers’ sourcing, recruiting, interviewing, hiring, and onboarding — gets so much attention.